e again be home to our giant 30ft Menorah. The project has brought together a number of prominent Jewish organisations including Chabad Lubavitch UK, Jewish Leadership Council, London Jewish Forum, Community Security Trust and the Jewish News Media Group. The Menorah will be located at a focal point in Trafalgar Square and is visible from a long way off. It will be remain in place for the whole of Chanukah (Tuesday 20th December - Thursday 29th December). 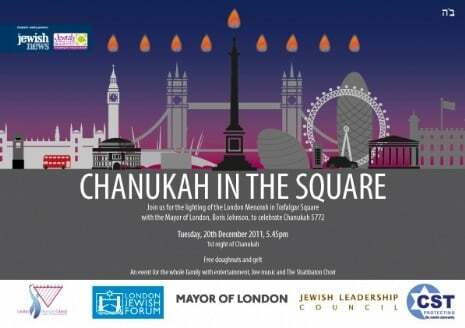 On Tuesday 20th December there is a major communal event taking place in the Square. It will be attended by hundreds of people including the Mayor of London, Boris Johnson. The event is open to everyone so bring your friends and family and join us to light the candles from 5.45pm. There will be entertainment, live music and doughnuts!